Cannabis within the international drug Treaty scheduling: Towards evidence-based policies! In 2020, for the first time since 1961, the scheduling status of Cannabis within International law could change. The scientific recommendations of the WHO on the therapeutic value and harms related to Cannabis sativa L., repealing their 1950’s ban, are likely to change policies globally, allowing Cannabis policies to focus on medical access, health and human rights. Our NGO has been impulsing the review process and serves as a watchdog to ensure the independence, objectivity, and comprehensiveness of the assessment. Last update: March 20th, 2019. On January 24th, 2019, the World Health Organization released the final outcome of its scientific assessments of Cannabis sativa-based products and substances, following the reviews undertaken at the WHO’s Expert Committee on Drug Dependence 39th, 40th and 41st meetings. READ THE FINAL OUTCOME OF WHO’S CANNABIS REVIEW. READ OUR DETAILED ANALYSIS OF THE OUTCOME. The international scheduling proposed by WHO provides with a highly simplified and normalized international control, as well as an increased possibility for countries to provide legal and safe access for medical use in a pragmatic, coherent, and rights-enhancing manner. While the adoption of these recommendations by the UN Commission on Narcotic Drugs was expected for March 2019, the Commission decided to postpone sine die the vote on the WHO Expert Committee’s final recommendations. It is now likely that the Commission only takes action on the WHO recommendations in March 2020 during its 63rd session. In November 2016, the World Health Organization (WHO) launched a process of scientific assessment of the uses (not only medical) and potential harms of the plant Cannabis sativa L. and its derivatives. The final outcome of the WHO will be recommendations to place Cannabis and its derivatives in the suitable “Schedules” of the International Drug Control Conventions. These schedules list all controlled drugs by their perceived level of harm and directly impacts the international law and regulation to be applied to the said drug. Part of the work of our team consisted in promoting a neutral, comprehensive and independent assessment, that recognizes and acknowledges both traditional knowledge and contemporary research on Cannabis (the plant) and cannabis (the “drug”). Challenging and changing the current place of Cannabis/cannabis within the International Conventions’ Schedules (until now included in the lists binding Countries to prohibit the use of cannabis and to eradicate the cultivation of the Cannabis plant) will have profound effects worldwide, increasing room and opportunities for scientific research, but also medical access and supply. More broadly, it will ease off the pressure against cannabis policy reforms at the country level, and allow cannabis policies to be integrated and linked to national policies on health, education, economy or development. The international obligations to prohibit cannabis – derived from the drug control Treaties (or Conventions) which consider cannabis as one of the drugs with the highest potential of harm and the least medical usefulness – have not evolved since 1961. This undue scheduling was slowly built with an obscure process that started in 1925, and that ended in 1961 with the inscription of Cannabis and its derivatives at the highest possible level of restrictive State control measures. Unlike every other drug submitted to international restrictions, Cannabis has never been scientifically assessed between 1925 and 1961, when it was included at first in the international schedules of the treaties. It has neither been reassessed after the discovery in 1964 of tetrahydrocannabinol, or THC, the main active molecule of the Cannabis plant. Moreover since 1964, even though dozens of new clinical applications were evidenced by research, no further scientific review of the plant and its compounds was undertaken. Since then, almost every single country has been following this scheduling, placing cannabis and Cannabis-based medicines and health products under the strictest national regulations, blocking availability and access for medical patients and researchers, making almost impossible legal production, trade, or quality certifications, and creating de facto an almost total prohibition of cannabis, thus generating countless collateral harms. While the current classification of cannabis in the Treaties is, almost unbelievably, from an outdated and obscure evidentiary process conducted before 1961, no scientific evidence-based process has been led to assess cannabis and classify it in the right Schedule since that date. “It is important to recognize the extreme complexity of international drug policy related to plant and substance scheduling, but also its primary and central role in the prohibition regime, and its impact on day-to-day practices and local policies.” – Michael Krawitz, FAAAT Global Policy Advisor. The process of scientific assessment by the Expert Committee on Drug Dependence (ECDD), only one able to change the status of cannabis within the Treaties schedules, is a routine internal process of the World Health Organization. It has however been repeatedly blocked since the adoption in 1961 of the Single Convention on narcotic drugs, while it could and should have happened long ago. In 2014, Michael Krawitz, Farid Ghehiouèche and Kenzi Riboulet Zemouli started to work together to act in favor of downgrading the level of control of Cannabis (and sometimes the associated prohibition) imposed to all countries by an international agreement dating 1961, and founding its roots in early XXth Century geopolitical arrangements more led by moral considerations than by evidence. The problematic scheduling status of Cannabis was our focus. The international community had just outrageously broken its own rules to avoid changing the scheduling of THC, times were changing, and so were the officials and personnel of international institutions. The UNGASS 2016 was on the horizon and Uruguay had just lost his struggle against the rest of the planet by passing a downgraded legalization bill. Our actions were tridirectional: past, present, and future. We started a comprehensive review of the archives and historical steps leading to the by-then scheduling status of Cannabis; we started mainstreaming the topic among United Nations stakeholders, decision-makers, researchers, civil society and the global cannabis community; and we launched a series of actions to ensure that the beginning of a process aiming to update the scheduling status of Cannabis would come as soon as possible. We render part of our work on this website, briefing our fellow drug policy reform advocates and all interested parties about the ongoing and expected changes in that domain. FAAAT think & do tank is a non-profit. 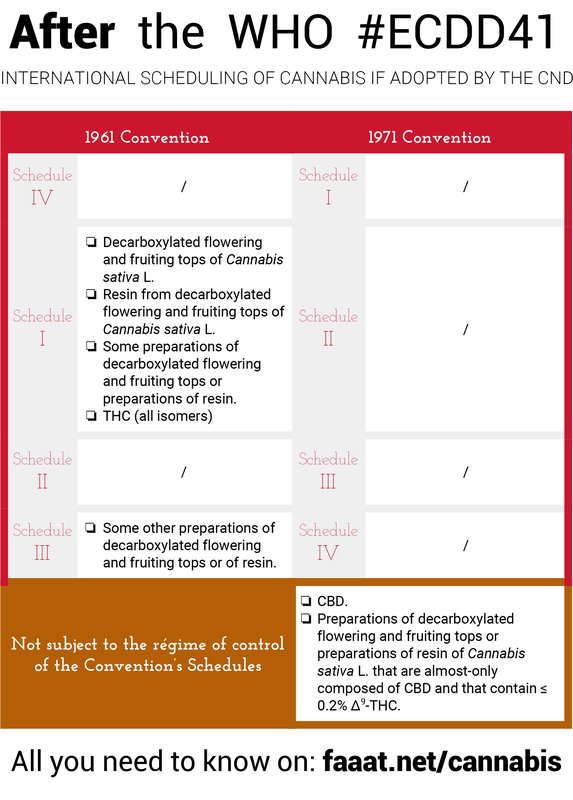 Understanding the Schedules of the 1961 and 1971 Conventions. The Countries that might vote the final recommendations. WHO announced the results for release on December 7th, 2018 (at the reconvened 61st CND session) and a vote mid-March 2019 (opening of 62nd CND session). But because of now famous “clearance” reasons, the outcome recommendations were only received by governments early-February, less than three months ahead of March 2019 CND 62nd session. At its 62nd session, the Commission on Narcotic Drugs adopted, by consensus, a decision to postpone sine die the vote on the WHO Expert Committee’s final recommendations. While the vote was initially expected to take place in December, it is now likely that the Commission only takes action on the WHO recommendations in March 2020 during its 63rd meeting. 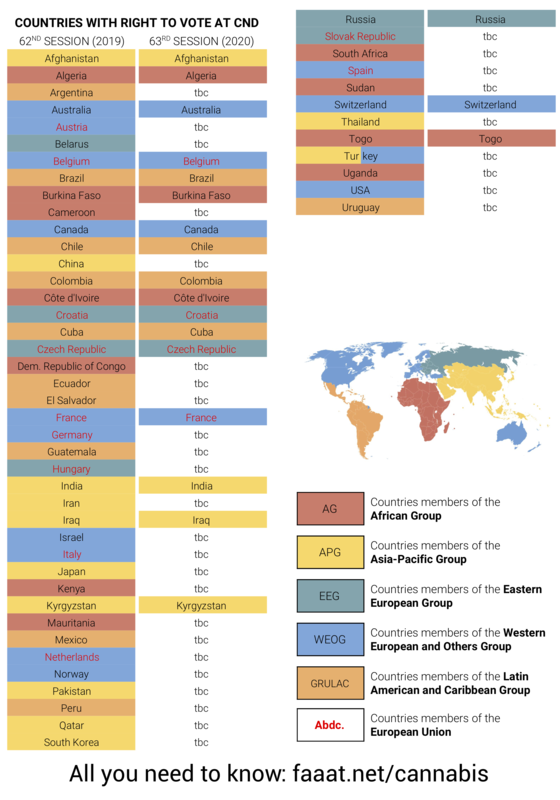 In this eventuality, the list of voting countries would evolve (see chart aside). Finally, and although it is unlikely, there are precedents where “the Commission on Narcotic Drugs decided by consensus […] not to vote on the recommendation of the World Health Organization”. Riboulet-Zemouli K. | FAAAT think & do tank, Geneva, November 2018. The Crimson Digest, Volume 2.
and the INCB’s update on Cannabis. Riboulet-Zemouli K. | FAAAT think & do tank, Paris, March 12th, 2019. ECDD40: Joint Civil Society statement on the Critical review of Cannabidiol and Pre-reviews of Cannabis, resin, extracts, tinctures and THC. Joint civil society contribution to the 40th WHO Expert Committee on Drug Dependence evaluation of Cannabis and its related products and substances – June 4th, 2018. Joint FAAAT-EIHA (European Industrial Hemp Association) contribution to the 39th WHO Expert Committee on Drug Dependence evaluation of Cannabidiol (CBD) – November 6th 2017. SUPPORT our RESEARCH and ACTIONS: Donate! Timeline of the review process. Below is the timeline of the different part of the review process of Cannabis and Cannabis-related products and substances. Timeline of the actions undertaken. 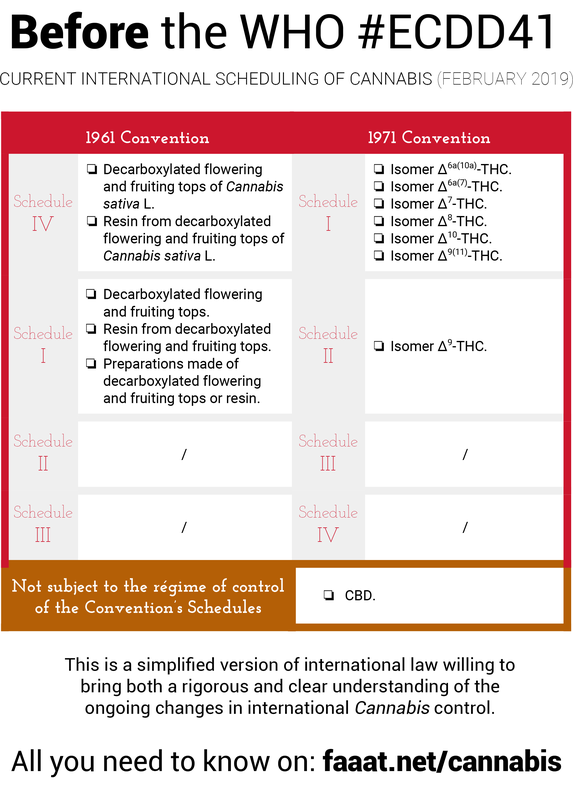 Below is the agenda & timeline of the past and upcoming actions to follow up and research Cannabis scheduling under the international drug control conventions. Click on the red boxes to display detailed information about each step. The Commission on Narcotic Drugs adopted, by consensus, a decision to postpone sine die the vote on the WHO Expert Committee’s final recommendations. While the vote was initially expected to take place in December, it is now likely that the Commission only takes action on the WHO recommendations in March 2020 during the 63rd Commission on Narcotic Drugs. During the reconvened session of the 61st Commission on Narcotic Drugs meeting, the WHO was supposed to present to Member States the outcome of their Critical reviews, and the recommendations for possible change in the scheduling status of Cannabis within the Schedules of the 1961 and 1971 Drug Control Conventions. That, unfortunately, did not happen. READ OUR PRESS RELEASE FROM DECEMBER 7th 2018. The International Cannabis Policy Conference started simultaneously and explored the policy and regulatory consequences of the WHO outcome recommendations, as well as the future of Cannabis policies globally and their link with Sustainable Development. Information about the ECDD41 Open Session. On July 23rd, the Director-General of WHO Tedros Adhanom Ghebreyesus (known as Dr. Tedros), sent a Note Verbale to the Secretary-General of the United Nations, António Guterres. The purpose was to inform him of the outcome of the 40th meeting of the Expert Committee on Drug Dependence (ECDD) held June 2018, that was dedicated to the scientific assessment of Cannabis and its related products. Guterres forwarded the letter to all countries Member of the 1961 and 1971 Conventions on narcotic drugs and psychotropic substances. A big part of our remarks (delivered in our Joint Statement to the Experts) was acknowledged by the WHO, and most of the weaknesses and bias in the preparation process seem to have been overcome… To be confirmed at the 41st ECDD (12-16 November 2018) where the final part of this assessment will be done. A very positive preliminary outcome was issued for “Cannabis and Cannabis resin”, as the Experts acknowledged that withdrawing the Cannabis plant from the “prohibition schedule”, (Schedule IV of the 1961 Convention) should be at the agenda of the 41st ECDD meeting, for a final decision going in that direction. The Experts also recognized the incoherence in the terminology and taxonomy applied to the products included in the category “extracts and tinctures”. Also, CBD was recommended for non-inclusion in the Treaties’s schedules, even though the journey is not over and the actual extracts of the Cannabis plant that are CBD-rich will be reviewed again as “extracts and tinctures of Cannabis”. The next step will be the 41st ECDD from 12th to 16th November 2018, where the final part of the assessment (Critical review) will be undertaken by the Experts. They are likely to issue recommendations for lowering the scheduling status of Cannabis, Cannabis resin, Cannabis extracts and tinctures (including CBD-rich extracts), THC and THC isomers. In June 2018 took place the 40th meeting of the WHO ECDD, special meeting dedicated to pre-reviews of Cannabis-related substances and the Critical review of pure CBD. On the occasion of the 40th meeting of the WHO Expert Committee on Drug Dependence (ECDD) dedicated to the scientific assessment of Cannabis and its related products, we delivered a Joint Statement to the Experts, underlining gross bias in the preparation process of the meeting. Written contribution from Civil Society organizations, experts, academics as well as patients and affected populations. 150+ civil society organizations from all continents endorsed a written contribution, pointing out and examining in detail the bias that undermined the review process. Among the signee organizations are scientists, doctors, human rights, affected populations, patients, students, users or groups of healthcare and dependence professionals. They come from Afghanistan, Argentina, Australia, Austria, Belgium, Bolivia, Canada, Chile, Colombia, Costa Rica, Czech Republic, El Salvador, France, Germany, Greece, Hungary, Ireland, Israel, Italy, Jamaica, Mexico, Paraguay, Peru, Portugal, Santa Lucia, South Africa, Spain, Switzerland, the Netherlands, Trinidad and Tobago, the United Kingdom, Uruguay, United States of America and Zimbabwe. In-person and video presentations from Civil Society representatives during the ECDD40 Open Session. Beyond the regrettable bias pointed out in the Written Contribution (see above), the Experts were given a broad and complete overview of the challenges, threats or human rights violations provoked by the current regulatory framework surrounding Cannabis. Among the stakeholders present at the Monday Open Session, all pointed out the barriers to access for therapeutical purposes or the disproportionate impact of criminal justice measures that derivates from the current Scheduling, particularly over minorities and women. However, series of technical issues made difficult a real concentration of the Experts on some statements, betraying the known heaviness of the “Organization” and its difficulties in preparing an event of such historical importance. Last June in Geneva, for the first time ever, the WHO listened to the voices of doctors, patients, and researchers, and started to analyze and weigh the harms and benefits of Cannabis for health neutrally. Their conclusions are likely to change international law and impact home policies globally. 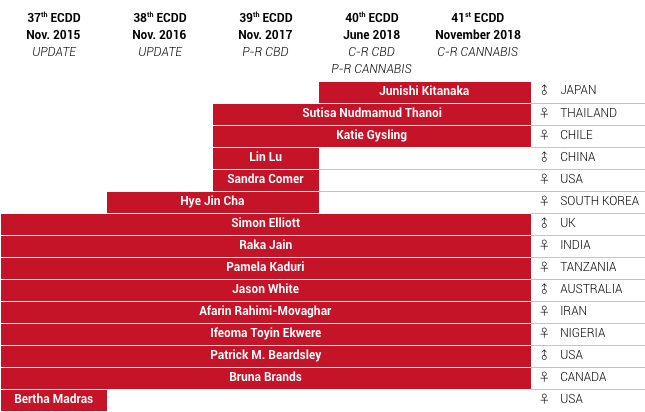 Learn more in our post: 40th ECDD meeting in Geneva: a pivotal moment for global Cannabis policies. In November 2017, as the Expert Committee was starting the review process with the Pre-review of Cannabidiol, we joined efforts with the European Industrial Hemp Association (EIHA) to present a joint statement on this occasion, both orally and in an extended written version (Main authors: Boris Baňas, Dr. Bernard Beitzke, Dr. Giuseppe Cannazza, Michael Carus, Hana Gabrielová, Farid Ghehioueche, Kerstin Iffl and, Michael Krawitz, Daniel Kruse, Eberhard Pirich, M.D., Kenzi Riboulet Zemouli). CBD is a safe to use substance that is beneficial to human health and public welfare and has numerous applications in industry and nutrition, cosmetics as well as health and wellbeing products, besides its promising benefits in diverse indications such as reducing anxiety or helping people to quit smoking. Applying the measures laid down in the international drug control treaties to Cannabidiol would severely restrict its availability for the non-problematic consumers of CBD and CBD-related products, as well as undermining safe access for many patients who already profit from CBD’s manifold health-related and homeostasis-supporting effects. In addition to diminishing public welfare, employment in the blooming hemp industry would be actively destroyed, and the already existing and regulated market of non-therapeutical hemp-based products would shrink significantly, despite just having experienced a rebirth after almost a Century of oppression. Finally, Cannabidiol does not fit any of the requirements or criteria for inclusion in the international drug control treaty schedules, and it lacks the properties usually attributed to psychotropic substances or narcotic drugs. Therefore we strongly urge the WHO to clearly recommend the exclusion of Cannabidiol from the scope of the international control measures, and reaffirm its unbelonging to the lists of internationally controlled substances. Press release EIHA-FAAAT on the outcome of the CBD Pre-review. In November 2016, we registered again to attend the 38th ECDD, although the security service of the WHO arbitrarily detained us and difficulted our mission. After having gathered for years an important number of elements of evidence supporting the obligation to start the review for the WHO, we combined these to other previous declarations of the UN Commission on Narcotic Drugs (CND) and the International Narcotics Control Board (INCB) supporting our request, and we wrote a letter to the by-then WHO Director-General Dr. Margaret Chan – sent again by hundreds of scientists and political figures. On three consecutive occasions before November 2016, the WHO eluded the review of cannabis by organizing pointless “update” meetings, with no procedural value in the scheduling process. In November 2016 however, the WHO finally decided to begin the review process for cannabis, under different items, starting with cannabidiol (CBD), and convening a special ECDD meeting to Pre-review all other by-products of the Cannabis plant. Reassessing substances: one proposed reading of the UNGASS 2016 outcome document. Contribution to the post-UNGASS 2016 thematic debatesorganized by the UN Commission on Narcotic Drugs, on October 10th, 11th, 27th and 28th 2016. This contribution has been posted online on the website of the UNODC and can be downloaded on our own website (only in English). work with a country delegation that formulated orally in plenary the ask for the launch of the review process of Cannabis by the World Health Organization. The public health dimension of the world drug problem has been widely debated during the special session of the United Nations General Assembly on the world drug problem (UNGASS) held past April, and along the preparation process held in Vienna since 2014. We note with satisfaction that the outcome declaration adopted at this Special Session recommends a renewed, balanced and scientific evidence-based approach towards the international drug control regime, while reaffirming the treaty-mandated role of WHO. In this regard, we would like to underline that the declaration precisely calls for “informed and coordinated scheduling decisions”.A deep concern is expressed in the declaration regarding the “low or non-existent” availability of internationally controlled drugs for medical purposes; as well, a “strong commitment to improving access” to those substances is made. In this respect, a more accurate scheduling appears to be one of the key issues towards a comprehensive availability of scheduled substances for medical purposes such as for the relief of pain and suffering. Recognizing that the evidentiary process under which Cannabis has been scheduled dates to 1935, and further recognizing that the financial difficulties of the WHO have compromised the functioning of its Expert Committee on Drug Dependence; we hereby suggest the Director-General to undertake the evaluation procedure for the critical review of Cannabis and Cannabis resin and ensure the accurate mobilization of resources, and thus call upon all WHO member states to consider assuming the extra-budgetary implications of this important and needed assessment. The supreme organ of the United Nations, its General Assembly, held a Special Session focused on drugs (called UNGASS 2016, for United Nations General Assembly Special Session). Among other positive elements included in the outcome document, the countries agreed on the need of renewing, balancing and basing on scientific evidence the approaches to the international scheduling system, and reaffirmed the role of the WHO. They also resolved to “[support] scientific evidence-based review and scheduling of the most prevalent, persistent and harmful substances” and called for “informed and coordinated scheduling decisions.”. For more information, see our Official contribution to the Commission on Narcotic Drugs about UNGASS 2016 and its links with the Cannabis review process and our Contribution to the 69th World Health Assembly. We started attending the ECDD meetings, on their 37th session. Cannabis was on the agenda as an “update”, which main document had been drafted by the controversed Pr. Bertha K. Madras. Our team member Michael Krawitz read a statement. Michael Krawitz’s statement at ECDD37 Open Session. Note: the statement uploaded online by the WHO has been censored and does not includes all the commentes regarding the inconsistency of nominating Bertha K. Madras for the update report. Until 2014, a review process for THC had been started at the WHO, thought to help secure access to some basic cannabis medicines, but also as a first step to try out the reaction of the countries. That process was brutally stopped by the countries through the UN Commission on Narcotic Drugs (CND), and the WHO abandoned the idea. At this moment, our team started to gather energy in view of a new start for the WHO assessment process, this time not only for THC, but for the whole plant. FAAAT (For Alternative Approaches to Addiction - Think & do tank) is an international advocacy and research program of the DRCnet Foundation. FAAAT addresses the policies of addiction, controlled and illicit drugs, and plants, products or substances liable to produce harms or dependence. We work with a multidisciplinary, transnational, non-governmental, non-partisan and non-profit perspective. FAAAT centralizes the collaboration of a global network of experts, with quarters in Austria, Czechia, France, Mexico, Spain and the USA. FAAAT think-tank researches rigorous evidence-based and ethical policy alternatives to face political, economic, and social drug- and addiction-related issues. Our research advocates for transparent and measurable policies framed by fundamental civic and human rights and the rule of law, grounded on sustainable development, social justice and health, that empowers affected populations. 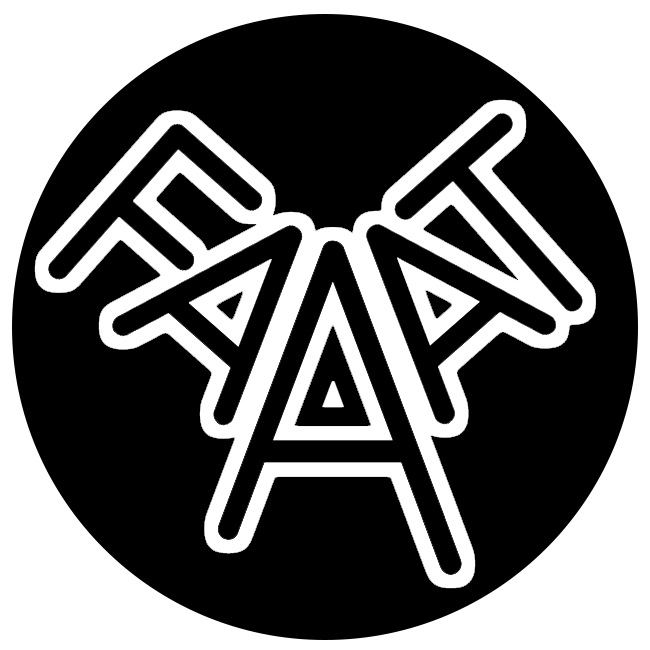 FAAAT do-tank develops collective support, capacity building and community advocacy programs headed to peer groups, ground social movements and the nonprofit sector, for a broader involvement in policy processes at all level, including international and multilateral levels. Our actions rely on social engineering and transversal work, merging affected populations, researchers, doctors, social workers, the law enforcement sector, policy-makers, and all relevant stakeholders. Evidence-based, democratic, transparent and measurable drug policies • framed by fundamental rights • grounded on sustainable development • empowering people and communities • and enhancing social justice and health. Research rigorous and ethical policy alternatives • and take action through advocacy at all level, social engineering, partnership and collective action • to upgrade policies and practices. Ground the updates of international drug policy on sustainable development, human rights, transparency, and inclusiveness. Goal #4. Strengthen peer groups, social movements and the nonprofit sector to increase knowledge, sustainability, effectiveness, and capacity for collective action on drug-related issues. Impulsing a modern approach to the categorification of “drugs”: renew terminology, taxonomy & scheduling to review the biochemical paradigm of drug use. Goal #2. Shift drug policies towards evidence and effectiveness: enhancing positive drug-related programs and actions from the ground.